If you came here for support, do this one thing. RetroPlayer is a new player core for Kodi Entertainment Center. It is similar to the video player and audio visualizer, but it plays games instead of movies and music. RetroPlayer: Code name of a new Kodi component that can play emulators, standalone games, and NVidia GameStream. 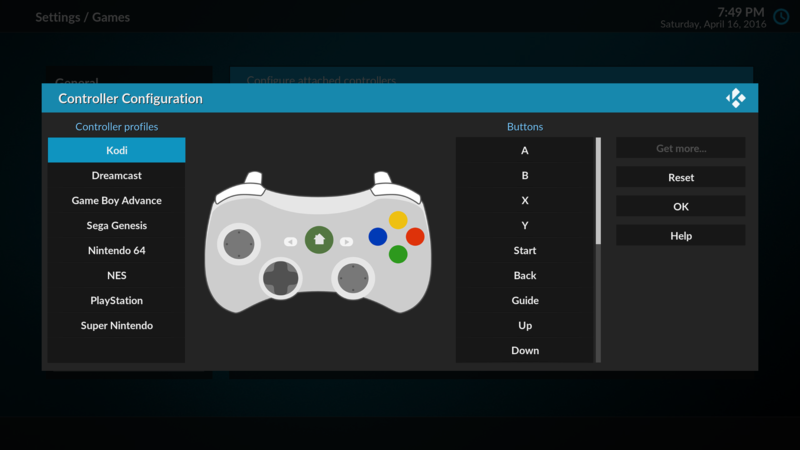 Controller support: Remote-friendly way to reconfigure controllers. Game save manager: Manage savestates and SRAM saves. This enables "gameplay persistence" - the game restarts right where you left off. Game library: What else other than the full Kodi experience? Box art, game trailers, gameplay videos, system intros, save states, and more. Network play: I fully completed a netplay add-on. It was slow and buggy and basically needs to be rewritten from scratch. Shaders: Let's start brainstorming what we want and how this could work. A CRT shader would be cool. After over four years of development, RetroPlayer was merged into Kodi v18 "Leia". Team Kodi doesn't ship emulators because they double the download size, and our add-on repo can't handle binary add-ons yet, so you'll have to get emulators from another source (such as my test builds) or compile them yourself. LibreELEC is able to ship binary add-ons, so you can test RetroPlayer with one of their Leia builds. To enable RetroPlayer, insert the secret cheat code. I updated the scope of the project. What do you guys think? I might suggest also listing shaders for future components. Making shaders mostly platform agnostic is probably quite a ways off, but I think the ability to emulate the look of a CRT screen might ultimately be a big positive for a lot of people. Hey garbear, i love reading your posts and I follow your work with great anticipation - I'm really looking forward to seeing this merged. I've asked this question about a year ago so I hope you don't mind me asking again - what do you think the chances are of this being included in the next release of kodi? How much shorter are the release cycles anyway?...every 6-8 months? When can we expect the next release to be? support for high resolution texture packs in addition to shaders would be awesome as well. @Lorax texture packs for what? roms? Yes, like what's shown in this article for Zelda. (2015-01-30, 16:17)Lorax Wrote: Yes, like what's shown in this article for Zelda. Well that's pretty cool. Definitely seems like a v3 thing though. Pls let #garbear concentrate on finish this thing.